And so have some of you fellow bloggers out there. It was only when reading Pub Curmudgeon's blog that I noticed he was now "http://pubcurmudgeon.blogspot.co.uk/" not "www.pubcurmudgeon.com". Wondering why, I didn't at first twig that I had been changed too. I had noticed that the quick edit pencil had disappeared a couple of weeks ago, but assumed it was a quirk. No that has changed too. The sinister reason for the domain change it seems, is to make it easier for Google to enforce censorship laws in specific countries. Great stuff eh? There is a nice blog on the subject here. I am still trying to work out what difference if any it will make to me, but since they didn't tell me about it, I must assume that their reasons for not doing so, are ones that they guess in advance I won't like. Might think of moving my blog. Google are too omnipresent. But where and how given the trouble Boak and Bailey have had? Fancy a Pint Somewhere Else First? I was talking (separately) to two of the lads in the pub on Sunday. One remarked that he'd had an enjoyable night at a beer festival in Manchester and about the pub that he'd gone to for a drink beforehand. Later, talking to an old mate at the bar, he was telling me of a bikers meet in Manchester - minus bikes and at a pub - and describing the beers they'd had in the pub where they'd gone for a drink prior to joining the scheduled function. Now I'm no stranger to this "meeting for a drink before meeting for a drink" thing, but it is an odd thing to do when you think about it. Is it a Northern custom? Is it a peculiarly British thing? Either way, I'm going to the Regal Moon with the boys tonight, but I'll probably meet Michael in the Baum for a drink first. In my case, my excuse is there might just be a bad selection of beers where I am going and a better one at the one beforehand. It rarely is so. Beer is a simple drink isn't it? Well it ought to be surely, but to read some of the concoctions that people boast about drinking you wouldn't think so. 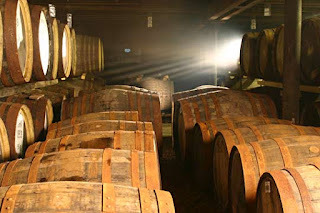 Barrel aged in bourbon/whisky/wine casks. Mucked about with and with unlikely sounding ingredients, usually with hugely unwelcoming alcohol content, these are often in my experience, more a test of endurance than a drinking pleasure. Not that most of us ever get a chance to try some of these experiments, as they are hard to find. While there are beer writers that talk of them a lot, it does seem to be a certain set of brewers, often young and as they see it, cutting edge, that big them up and set a scene that gullible fan boys are keen to follow. In attempts to outdo each other, even more outlandish stuff can be expected. Some will work, but many won't and just don't. But they will sell. Ex blogger Jeff Bell put it rather well in a tweet this morning in reply to beer writer Pete Brown; "@PeteBrownBeer personally I've never had a barrel-aged beer I've liked. Suspect there's an unclothed Hapsburg at work. Talking of Pete Brown. He wrote rather an excellent piece for London Loves Business about the delights of session beer. You can read it here. He says about strong and unusual beers " I have found myself, whenever I’m given a choice, opting for the adventurous. I have to; it’s what I do." It is indeed, though most of us aren't in that position, which given the descriptions of some of them, makes me feel rather lucky. Pete goes on to expound the delights of the session beer. Quite right too, for this is "proper" beer drinking. It is what makes our beers in the UK so splendid. Their sheer drinkability. Pete continues: "But sometimes you find yourself at a bar where every beer you want, you want it to be the last beer of the night. That’s when you yearn for the session pint – your trusty friend with whom drinking responsibly doesn’t have to mean not drinking enough." I identify with that. In my recent post about meeting Garrett Oliver and drinking some of these strong exotics, I missed out one thing. When I left, I went to the Angel and ordered a 3.9% pint of something pale and swoopable. I had a drink of beer rather than an experiment. It was the best drink of the night, though it might not have been the best beer of the night. There is of course room for both types of drinking and of course there are good "experimental" beers out there and of course a lot depends on personal taste. The siren call of money isn't far away either in all this. These beers can be lucrative, but I wonder in all the talk we have about CAMRA being old fashioned, if we in CAMRA haven't got the basics right? Beers you can drink a few of without falling over and beers that you can drink without grimacing at every sip, while, since you've probably forked up a fiver or more for a for it, feeling obliged to tell everyone how awesome it is. Even if it is giving you the boak. Maybe some of this snobbery, one upmanship and pretentiousness is helping put CAMRA types off "craft" beer? Must quote Pete once more: "Tasting @HarviestounBrew Old Engine Oil aged 6 mths in a Grenache barrel on wine lees. Wow. Just wow. Redefining what different drinks are." This blog post is unashamedly about CAMRA. One phrase was striking though. Ian said "The National Executive" has a responsibility to redefine CAMRA's role". He remarks "Imagine if in 40 years time we're still campaigning for real ale as currently defined and deriding other beer styles." Indeed. That's quite a thought. Everything moves on and it is the role of leadership to ensure that the Campaign is capable of sustaining itself into the future. Some of what Ian says is being done though through the Fit for Purpose Review, which I had a hand in. Ian will be pleased to note that closer working with other beery organisations is firmly embedded in that piece of work and has already started I believe. The Fit for Purpose Review was an attempt to position CAMRA for the future and was a jigsaw piece in making CAMRA think more clearly about not only what we are doing, but what we should be doing in the future and how we should do it. I think that's still a work in progress, but it is a start. Holding the NE to account for progressing it will be key in the year to come. I was pleased too, to read in WB a couple of progressive motions to the AGM from two of our more aware NE members. Motions 15 and 16 both refer to craft keg beer and are welcome, but whether they will pass muster at the AGM is open to question. I won't be there sadly, as Torquay just doesn't fit in with my plans, but I regard these two motions, particularly motion 15, as a stepping stone to next year, pass or fail. I will be there next year and there will be more motions. I have a year to think and plan, as I believe we are approaching a critical period in CAMRA's relevance and that certain nettles must be grasped. It was pleasing too to note that at last we have some competition for NE places and there may well be more in the future and that the Chairman (Colin Valentine)identifies the Anti Alcohol Lobby - he rightly refers to them as "prohibitionists or abolitionists" - as a body that must be fought vigorously. So positive things, but we must have a leadership with the courage and vision to make the changes that will mean that CAMRA retains its undoubted relevance. CAMRA and that means the NE particularly, must have the courage to swim against the prohibitionist tide, to recognise industry change and to make CAMRA clear sighted in playing a leading part as both a campaigning and lobbying force in UK brewing. So, to those members reading this and going to Torquay, support progressive motions, listen carefully to the update on the Fit for Purpose Review and help shape CAMRA for the future not the past. Now to another point. Remember the group that CAMRA set up to look at craft beer? I was a member and have news on that too, but you'll have to wait until later this week for it, as this background piece needed writing first. I doubt that you'll be impressed by the outcome though. Next year we are in Norwich, a proper beery city and a train an hour from Manchester. And what is that in the palm tree? This Conference believes that CAMRA policy should recognise that “Craft Beer” is beer with a distinctive flavour brewed by artisans. As a consequence, most real ales are craft beers but not all craft beers are real ale and CAMRA’s communication should reflect this. This Conference believes that real ale is the indigenous beer style of the UK and notes that CAMRA will continue to concentrate its beer festivals on this beer style. Conference also recognises that there are some perfectly drinkable craft beers that are not real ale, and where CAMRA is required to provide a full bar, consideration will be given to selling keg craft beers as opposed to other keg beers. 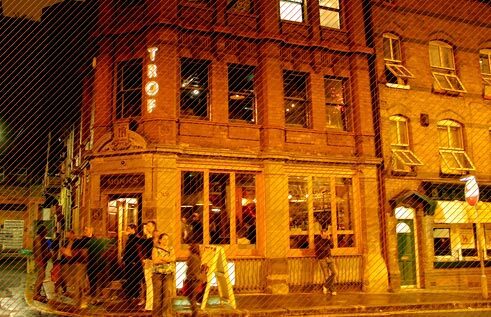 Trof is one of those trendy new bars that Manchester and surrounds do so well and others seem to do so badly. 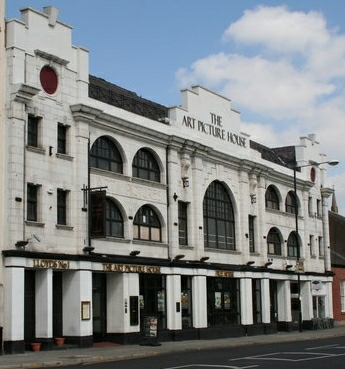 It is in a lovely old building, just along from Shudehill Interchange, thus handy for me and my nemesis, the 17 bus. Downstairs it has a nice bar with the usual sofa-ish mix of furniture and big windows. Troff sells some good stuff, some mainstream and thankfully, cask beer - like most such bars in Manchester - though it isn't right up there on the beer front, being more a solid, dependable venue which attracts a good crowd. I've been there with Tyson and had some excellent beer and been there when we have had to retreat as nothing appealed. Upstairs in the eaves is another bar. A bit more pubby perhaps, but still trendy enough for those that need trendiness. If I was 30 odd years younger, I might call it cool, but I'm not, so I'll just content myself with "nice". I was there to see one of the stars of the brewing firmament, Garrett Oliver and a small but anticipatory crowd found seats and awaited the great man's arrival. Now, I have met Garrett a couple of times before and he is the most charming and articulate of exponents of the glories of beer. He is enthusiastic but doesn't gush as some do and has a very clear speaking voice. That was handy for us all of course, especially as drinks loosened standard British reserve. Still no whooping and high fives here though. In fact Garrett remarked that it was all rather quiet, but that didn't last. Courtesy of James Clay the importer, some rather exotic beers were on offer. I think it fair to say, a mix of the commercial and the experimental. Garrett emphasised the uniqueness of some of the brews and their very limited availability. Some in fact having been specially bottled for Garrett's UK visit. After a preamble with Garrett describing his early career, it was straight into the beers. Now I won't describe them here, as Ghost Drinker has done a far better job of describing them than I would, not having taken any notes. We did have them in a slightly different order though, with Brooklyn Lager kicking us off and a very nice drop it was too. Garrett's description of the more experimental beers is best read in Ghostie's blog, but I thought The Companion, a wheat wine, more interesting than enjoyable. To me the flavours all clashed somewhat, but hey ho. Next we had Mary's Maple Porter, a 6.9% beer made with maple syrup from the Brooklyn Brewery Quality Control Manager's own maple trees and apparently the most expensive ingredient ever used in the brewery. It was luscious and enjoyable, but to this writer at least, the maple didn't come through as strongly in the finish as predicted, which was a pity. All through the tasting, neat morsels of delicious food appeared, such as ribs, mini hamburgers, spicy chicken etc. All were excellent accompaniments to the beers. As the beers started to cause people to lose their shyness, questions began to flow and the event became much more interactive and relaxed. We then sampled another experimental beer, Cuvee de la Crochet Rouge Rose. If you like complex gueze like Belgians, which I do, it was a wonderful complex beer. Ghostie's description is spot on, so check that out. Black Chocolate Stout needs no introduction and it lived up to its promise, with a complex array of roasty flavours and evident alcohol. Lastly we had one I'd been looking forward to. BLAST is a 9.0% beer described as a "Big IPA". It lived up to its billing and was big on C hops (though) English hops were used too. A great beer to finish on and one I wished I'd been able to get another glass of. I asked Garrett three questions: the first was about his views on the use of so much crystal malt in US beers. He reckoned it was mainly a West Coast thing and thought perhaps it was because American Craft Brewing is so heavily influenced by formative years of home brewing. He agreed with my proposition that you can't overcome over use of hops, by adding crystal sweetness. My second question was about how he thought his beers might be if slightly reduced in alcoholic strength, particularly the Black Chocolate Stout. His answer was basically that he felt that alcohol adds a layer of complexity and further added that BCS is a beer that develops as it matures. The one we were drinking was fairly young and the alcohol much more up front. Older ones are softer and smoother. So perhaps a tip for those keeping some back in their cellar? My last question was about clarity in beer. Garrett was of the view that it was horses for courses. Some beers are better pin bright and that overall there was some doubt as to which route was best. He was a little scathing about some American attempts at cask beer and thought that cloudiness or haziness in a beer was a difficult one to get right, as it goes much wider than flavour itself - and that is difficult enough. One other question, put by another guest was around how many hops is too much. Garrett used the analogy of a chef that over salts his food to the point of inedibleness and then when confronted, shakes his head sadly and says to the diner "You just don't get salt do you?" Much laughter to that one. I had a quick chat to Garrett afterwards and we talked about JW Lees (where I'd met him before) and about the people there. Then a photo with the great man (as a lot of people did). All in all it was a delightful night and you have to say, Garrett is erudite, knowledgeable, likeable and oh so approachable. A real nice guy in fact. 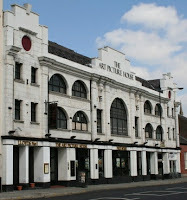 I was invited (along with all of our CAMRA Branch members) to the launch of JDW's Spring Beer Festival at the Art Picture House, one of two in Bury. JDWs that is, not Art Picture Houses. Now this proved to be a good day out, though involving as it did that drinking leg end Tyson, it lasted a lot longer and was more intense than I intended. In addition to the beers on the bar, we had the bonus of "Meet the Brewer" thrice. Hawkshead, Naylors and Titanic all showed up and to the delight of the assembled throng, dished out copious free third pint samples. This greatly pleased Archimedes and Pythagoras, but the Whitefield Holts Bandit disdainfully eschewed the freebies, while Pineapple Pete, as usual, concentrated on the free grub. Tyson and I, veterans of such largesse and aware of the Bury public's propensity for free ale, had no such scruples and just elbowed the coffin dodgers aside to park ourselves in front of the nine of Windermere Pale (Tyson) and Titanic Plum Porter (me). I did have a constructive chat with the Titanic operative, who advised that the plum essence was made by a local sweet manufacturer after using real plums failed to deliver any plum flavour at all. Nature isn't always best it seems. 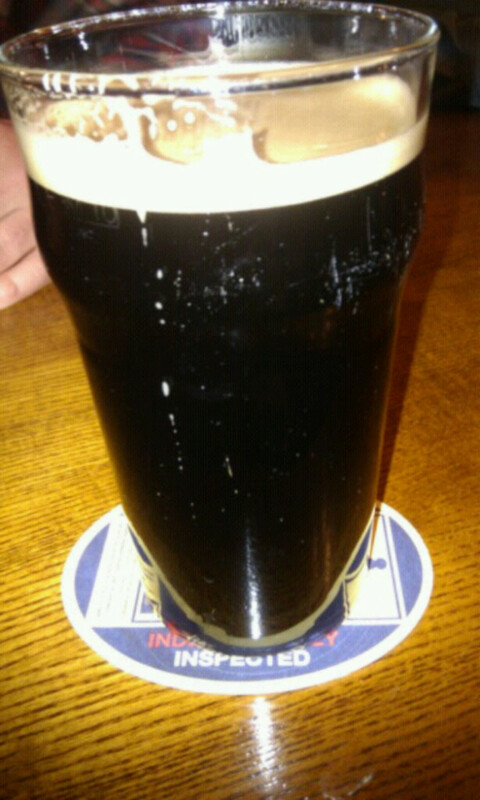 So back to the Art where handpumped Titanic Plum Porter finished us off. Literally. We did have the bonus of seeing Joe Stalin and of course, Don Ricardo who had joined the mayhem earlier. I dashed for the 163 and the long toilet-less trek home, while Tyson remained to observe the ever keen Don in pursuit (unwisely in this case I can assure you) of the carnal. Our thanks to JDW's Lisa for the butties and the sausages and to the brewers for their free beer. I thought I'd look back on my blog on today's day in past years. Well in this instance three years ago. I was writing about a rant by a geezer from Marston's, which was wide ranging, but gave CAMRA a good kicking. There are some good comments from a guy called Woolpack Dave (whatever happened to him?) and a wide boy called Gazza. Even if I say so myself, it is pretty good and the comments seem equally valid today. We haven't moved on that much in three years. Or have we? Read it all here. This day in 2008 I was singing Glasgow's praises, but the rant is far better. Spring was in the air as me and E strolled into Middleton to walk part of the way to the pub, a distant four and a half miles hence. A tall, slim figure was coming the other way. I recognised him immediately as J W Lees Second Brewer, or rather, to give him his proper title, Brewhouse Manager. We stopped for a quick chat. "On the way to the Tavern?" he posed. "Yes" I replied for it is hard to deny that I am a creature of habit on a Sunday. 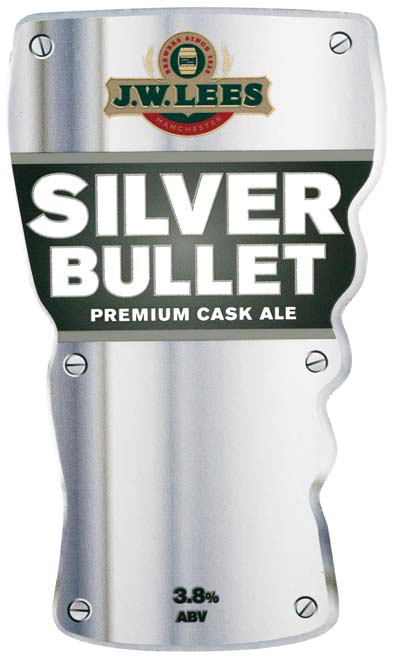 "Tried the "Silver Bullet yet?" he asked, referring to Lees new seasonal beer. I replied that I hadn't yet seen it anywhere, therefore hadn't tried it. "Too hoppy for me" he said, hurrying off to his local Lees pub to watch City. Now I am known at Lees for my liking of hops. I was having my leg pulled. Wasn't I? the end for a slightly mellower finish." Like the Pub? - Don't Like the Beer? There are loads of good things in London and loads of bad. Like most places really. We'll all have our own lists I am sure. When it comes to pubs though, London has some crackers. Many of them are just how you'd like a pub to be - or rather - they are just how I like a pub to be. 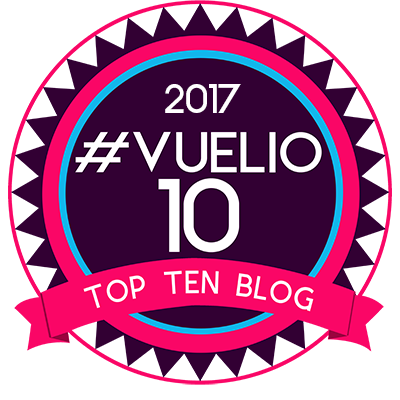 You for all I know, would like a big barn with blasting gangsta music, crack openly on sale, an underlying frisson of impending violence and wall to wall people drinking out of bottles - though of course why would you be reading my blog if you did? Near our flat there are two, among the many, that I particularly like despite beery considerations. They are worth a mention as they seem to be real pubs. Proper places where actual people go more than once, rather than, as is the case with many parts of London, where they just end up after work, then disappear into every compass point there is. That is the nature of London of course, but people do drink there and some of them even seem to go to pubs to the extent that they are known by name and it isn't "Hello Love." So what do I like about London pubs so much? Well often it is that they have nice original features. They will have lighting dim enough to make the place feel cosy, but bright enough to see a hand in front of your face. The sort of cosseting snugness that makes you feel once you are in, that the world and all its troubles are far away and can be forgotten for a while. There will likely be nooks and crannies - I like them - and often, there will be big picture windows, bric-a-brac, old brewery mirrors, snob screens, etched windows and an interesting and varied clientèle. There will likely be comfy bench seating and mismatched furniture, because it has been acquired over the years. It will shine like a new pin and a friendly barperson will smile at you and say "What can I get you? ", not the moronic Manchester greeting of "You all right there?" OK I exaggerated the smiling greeting bit, but you get the picture. Ah yes. Nice pubs. One near me which we have gone into off and on over the years, is a Shepherd Neame pub. It is snug and cosy, long and fairly narrow, but it opens out. It has a mixed set of customers and ticks most of my other boxes. The beer just doesn't. Not the quality of dispense, but you just can't make a silk purse out of a sow's ear - and Shep's cask beer is at best a sow's ear. But I - we - like this pub and among other things, the installation of a modern juke box which isn't played at deafening level, has found me, a music in pubs disliker,suggesting we go there. It has over a million songs this juke box and the pub barman chats to you, remembers you, discusses football with you. The other pub near us that we, well me really like, does have a reasonable choice of beer, but keeps it so badly you want to offer your services free, as cellarman for a week, just to show the bastards how its done. But I like it, though it has been knocked about a bit, because it is a really good pub in that kind of indefinable way you get sometimes. Anyway, I suppose I have answered my own question. If you like pubs, the beer can never be your sole reason for going there. "Pint of Spitfire please and anyone playing that jukebox?" Last night at the Baum in Rochdale, I was taking a few trial pictures before starting our presentation to them as CAMRA Pub of the Year. Hence this one of the bar. Note the little sample glasses in front of the pumps. For some time now the Baum has these dinky little glasses to show the customers what the beers on offer look like. I'm forever asking bar staff the colour of an unfamiliar beer (most have no idea of course.) Here's a simple and elegant solution, which provides great and cheap customer service and makes life easier all round. I am not sure if I've seen it before, but isn't this a good idea? Maybe that's why the Baum is such a good pub. You may or may not have noticed that one of the four remaining Manchester Family Brewers, Hydes has decided to close its Moss Side brewery and move to a green field site. The main point of this being the age and location of the venerable brewery itself. (I have visited it and it is indeed very cramped and yes, very old.) The family remain firmly committed to brewing and the new site, though smaller, will produce exclusively Real Ales. It is expected that they will produce a core range plus seasonals and special brews. The family will remain as owners and will take an active role in the running of the new brewery, though all the free trade business has been sold to Thwaites. That was roughly the picture in January, though I have omitted some of the more mundane details. Since then it has been revealed that the new £2 million brewery will be based in the former Greenalls Distribution Centre at Media City in Salford. This is a modern 20,000 sq foot industrial unit and it is expected that the new brewery will be fully operational by September / October. The brewery will be a fully automated, brand-new brewing set -up, with an initial capacity of 5,000 barrels per year. This is a huge fall from current capacity and production and even allowing for the loss of contract brewing (including cask Boddingtons) is quite astonishing. The brewery is probably knocking out around 40,000 barrels currently, though it was as much as 88,000 barrels when Boddies was still being bought in quantity. According to their web site Hydes has 66 pubs. A 5000 barrel brewery would be able to supply each pub with around six nines a week. The obvious conclusion from that is that most of the requirements of the Hydes estate are going to be bought in from elsewhere. A two million pound brewery, producing around 100 barrels a week, just doesn't seem economic. 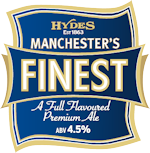 I understand the Hydes Production Manager, Paul Jeffries will be guest speaker at Stockport and South Manchester CAMRA Branch meeting this week. The answers to the many hard questions that should arise will be very instructive. This blog piece draws heavily on CAMRA information. I have also heard the cask Boddies is likely to be discontinued. I have plummeted from number five to number eighteen on whatever Wikio is called now. I had planned this post Saturday night. Honest. Not exactly like this, but more or less. I am not copying you or jumping on your rolling bandwagon. Cross my heart. "The weekend was good, though it did start off with a long lecture from E about how, as we aren't getting any younger, there has arisen an urgent need to visit expensive restaurants. I haven't felt this need, though mortality is always at the back of my mind. So unreceptive was I, that it took quite a lot of time to knock the idea into my head to an extent that allowed me to go to bed - albeit at half past bloody two. I am not saying an excess of wine afflicted E, but in the morning, it somehow seemed less important to her." Nonetheless the idea wasn't completely abandoned. Thus it was we booked one of London's top Indian restaurants, Cafe Spice Namaste. It is rather convenient for our flat and falls into E's definition (albeit at the bottom end of her expectations.) We have been before, but were vaguely disappointed and it was some time ago, so we duly reported, had highs and not so highs and left full up, but feeling perhaps it lacks the precision of cooking, particularly in spicing and sauces, that is so important in Indian food and that you will get in say, Mother India's Cafe in Glasgow. But this isn't about the grub. Of course before choosing a tasting menu so we'd get the full gamut of the kitchen, we wondered what to drink. There was quite an extensive wine list, but wine doesn't really go with curry in my view. The beer list was one in number. 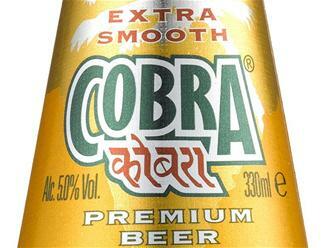 Cobra - in big or small bottles. 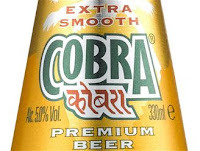 I remarked to E at the time, that while Cobra was perfectly decent (though pretty neutral in taste) that an IPA would have been nice, or maybe a wheat beer of some sort would have been worth a go, to complement what was a pretty diverse set of flavours. Alas no, it was Cobra or nothing. This is where we come back to Boak and Bailey. They've said what I wanted to about the subject in generic terms. In this actual example, Cafe Spice Namaste has a menu that is very well put together, diverse and thoughtful and clearly chosen with care. The beer list though was a cliché. A single cliché at that. This isn't a go at this particular restaurant. They are doing what most do, as B&B point out. But is that really good enough? I don't eat out in "proper" restaurants all that much and when I do, I'd like a decent choice of beer. Please. Many years ago in Edinburgh I enjoyed a beautiful bottle of Deuchar's IPA in a Leith Curry House. That would be a contender. Or White Shield, or a Schneider Weisse. "What's the difference between characterful and rough?" I pondered from the top deck of the 55 bus bound for Oxford Street. Wind back two hours and I was walking tentatively from Walthamstow Central station towards the King William IV, the home of Brodie's Brewery. I say tentatively as I wasn't entirely convinced I was heading in the right direction and I was in what seemed a rather dodgy looking part of London. A quick check at a bus stop map reassured me and crossing the busy junction at Lea Green Road found me outside the pub, unscathed. The pub itself is great. A proper pub with bench seating, two large rooms and long windows giving it a bright feel. Two very handsome Truman Hanbury and Buxton mirrors caught my approving eye. Fine examples indeed. 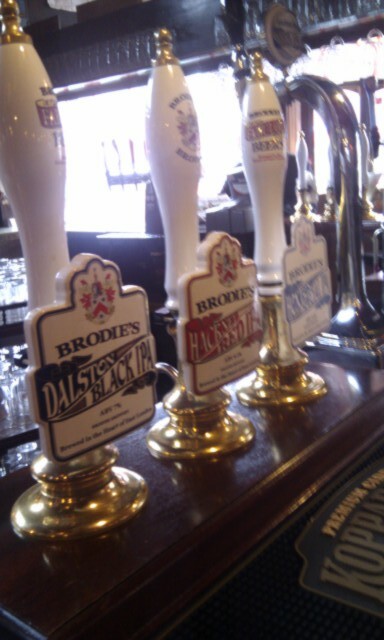 The bar positively bristled with handpumps, almost all selling Brodies own beers, though I did spot a Magic Rock one. A few locals with proper Lahndan accents conversed and all seemed well with the world. Brodies Citra was superb for such a weak beer, but it was the Shoreditch Sunshine that er.. shone out for me. A super golden beer with plenty of malt to shore up a Galaxy hop driven taste. A cracking beer. I tried the American Brown which was a good example of the style and the locals favourite Bethnall Green Bitter which was a very decent drop. I didn't try the strong beers on as I'd a full afternoon ahead, but what I had was very good, cool and in great condition. Nor did I ask if they did thirds, but that would be great for trying a few more. Either way, I will be back. Thanks to Twitter I was advised to get the 55 bus back from opposite the pub. A stroke of luck saw one come immediately and a top deck front seat gave me a birds eye view of things as the bus wended its way back west. I noted quite a few closed and boarded pubs and many ex pubs put to other uses, but plenty still seemed to be open, so a mixed picture. Now back to my question. I am not sure exactly, but visually the areas I passed through on the way back, like Hackney seemed "characterful". Leyton seemed "rougher", but I couldn't really define why. There you have it then. Its just a feeling. I had intended to nip into the Old Fountain,but missed my stop and carried on to Clerkenwell and the Gunmakers. The irrepressible Jeff Bell was there. The beer was good and sparkled, though Jeff tells me his range of beers are chosen to suit his local customers who prefer less hop forward darker beers. Fine. He still keeps them perfectly and it is stil a great little pub. I enjoyed my drinks, particularly East London Brewery Pale Ale. No visit to Clerkenwell is complete without a visit to Craft. I have never had a bad pint there. A couple of halves of porter and stout would certainly have benefited from a sparkler though. 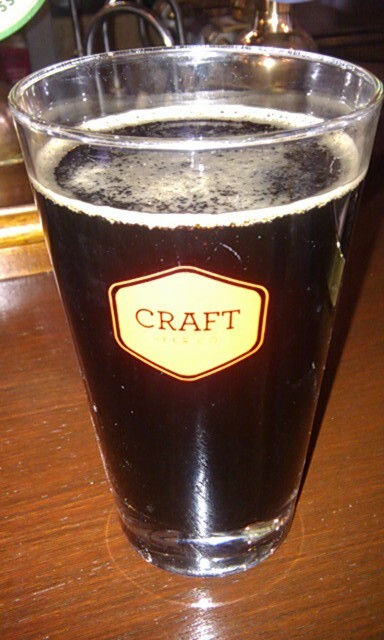 Thornbridge Creamy Vanilla Stout needed the creaminess a sparkler would have brought. I had a nice chat with fellow Scot Tom, the Manager, who doesn't believe in them. Cutting a long story short, we agreed to differ, but thanks to him for talking to me about it. And I must repeat, sparkling a well conditioned beer does not flatten the beer, which was Tom's main concern. So, a good afternoon. No bad beer at all, a smashing pub that was new to me visited, a chat about sparklers and good timing with buses and trains. London worked well yesterday. Best beer of the day? Shoreditch Sunshine. What a good beer. They know their stuff at Brodies. I have the whole day ahead of me here in London. Where shall I go? Maybe to check out one or two things? Is the Draft House cask beer any good? Is the Southampton Arms still buzzing? What about Mason and Taylor, not far at all and like the Draft House, shall we say challenged in the cask ale department, at least it was previously? That certainly could do with a check, as similar to the Draft House, I like the place immensely, but not so much the warm beer. Maybe Welsh beer at the Rake? I know. Welsh beer, but still. Maybe out to check out Brodies at the King Bill? I could even go to Camden and have a gander at BrewDog - only kidding - you knew that - or I could just go to Clerkenwell and know I'll get good beer. London's beer world is at my feet. Better get dressed then. Ideas welcome. It's still a while until opening time. Of course I need to go to Waitrose for the shopping first.